NZ journalist Melanie Reid has produced a mini documentary about the film Vaxxed: From Cover-up to Catastrophe which is now screening in NZ. Melanie Reid’s piece includes interviews with vaccine proponents Dr. Nicky Turner and Dr. Helen Petousis-Harris from the Immunisation Advisory Centre (IMAC). IMAC is based at the University of Auckland and receives funding from the Ministry of Health to promote vaccination. IMAC also acknowledges receiving funding from “private industry”, presumably pharmaceutical companies. 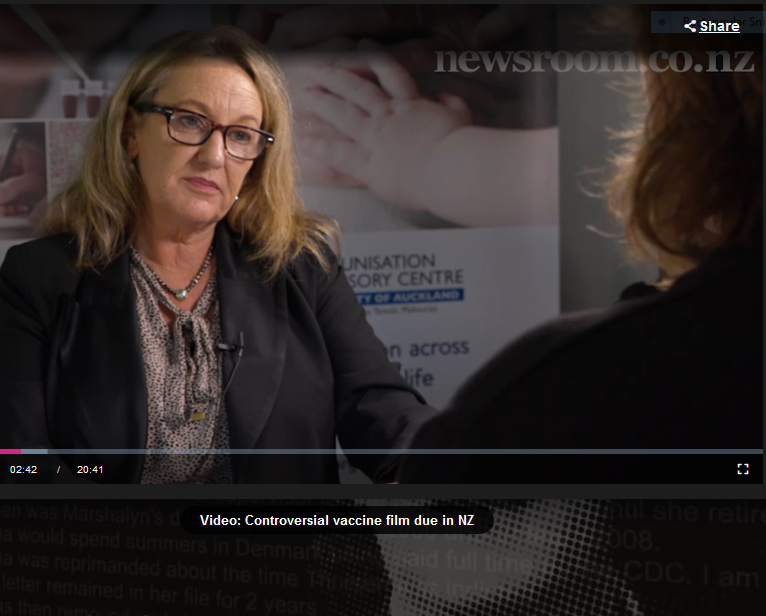 Melanie Reid also interviews Sarah Cox, one of whose sons developed autism following MMR vaccination as well as Truly Godfrey from WAVESnz, a parents’ group in NZ that provides information about vaccination as well as support to families who have been affected by vaccine-injury. Above: Melanie Reid (pictured) interviews Helen Petoussis-Harris from IMAC.